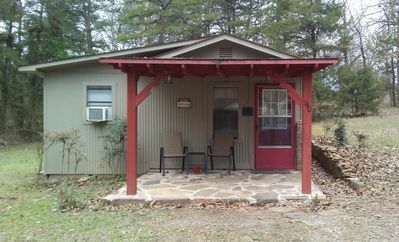 Creekside Cottage Information: Located just outside of the Shoal Bay Recreation Area gate in New Blaine, AR sits this tiny cottage. If you like to fish and enjoy all of the amenities that Shoal Bay has to offer but do not have an RV, this is the place for you. (Please note that the Recreation Area is only fully open March through September. 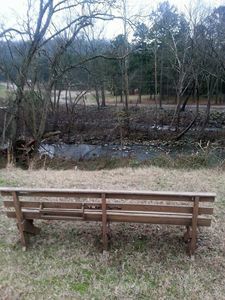 If you come in the off season you can still enter to fish and hike, but the restrooms and swimming area will be closed). The tiny cottage is perfect for couples but can sleep four if the futon is used. This is not a 5 Star Hotel. 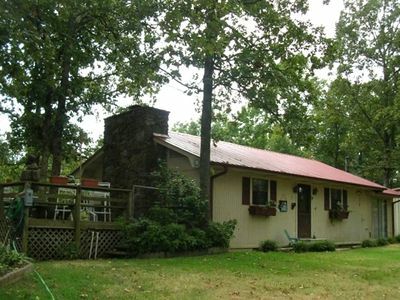 It’s a cozy, comfortable, and conveniently located cottage that won’t break your budget. 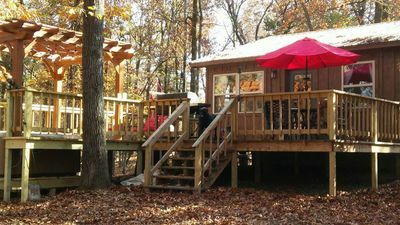 Creekside Cottage is a total of 400 square feet but offers a sitting area and kitchenette with coffee pot, microwave, small crock pot and mini fridge. (A larger fridge is located under the picnic pavilion.) There is a TV with DVD player and a selection of movies. Sorry, but no other TV service or WiFi is available at this time. A separate bedroom features a queen size bed with a comfortable 12" memory foam mattress. The rustic decor bathroom includes a large shower. Linens and dishes are provided. 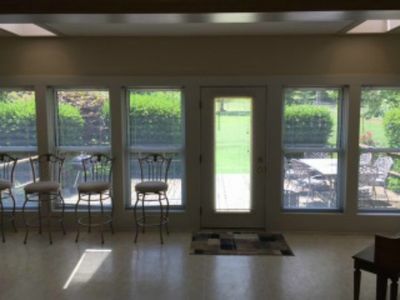 Temperature is controlled by a window unit and ceiling fan. A heater is also available for those of you that are cold natured. Not only are you within walking distance of the Recreation Area. 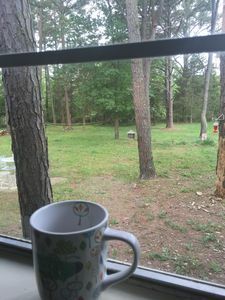 Which offers swimming, hiking, fishing, and a playground, the Creekside Cottage property has several great things to offer. 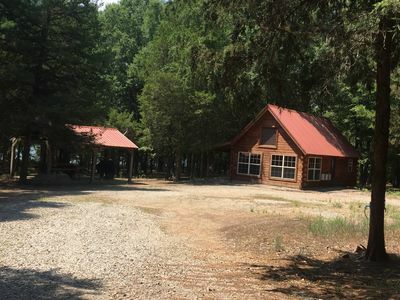 A separate two car carport (approximately 200 feet from cottage) is available to park your vehicle or boat as well as a picnic pavilion sitting alongside the small wet weather creek that crosses the property. The charcoal grill, and fire pit add to your outdoor experience. 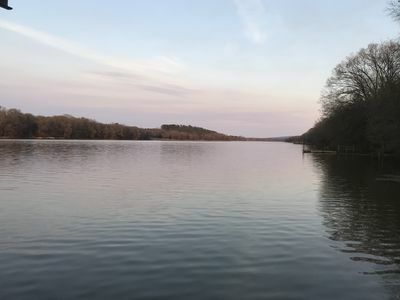 Local Information: There is a large Dollar General, two convenience stores and a restaurant located within approximately two miles of the cottage. Menus are provided for your convenience. Area Information: New Blaine is half way between Paris, AR (The Gateway to Arkansas' highest point, Mt. Magazine) and Dardanelle, AR (Home of Beautiful Mt. Nebo). See these two mountains and take a 45 minute drive to Petit Jean State Park to complete your Tri-Peaks Tour. Spring Lake Recreation Area and the Huckleberry Mountain ATV and Horse Trail System, are both located in the nearby Ozark National Forest. Stop in Subiaco on your way to Paris and tour the beautiful Catholic Monastery - Subiaco Abbey. In Paris, you will find Eiffel Tower Park, a nice place to add your Love Lock to the fence and take pictures at the tower fountain. Also located in Paris is the Cowie Wine Cellar and Museum, part of the Arkansas Wine Trail. One hour away is historic Ft. Smith, Arkansas where you can ride the trolley and visit the Ft. Smith Museum of History as well as the Ft. Smith National Historic Site (home of the Judge Parker gallows). 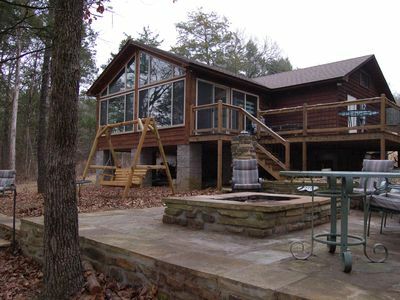 Spacious, Secluded, Peaceful, Must See to Believe! 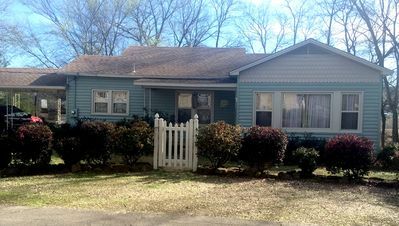 Charming Cottage in Paris, AR .... 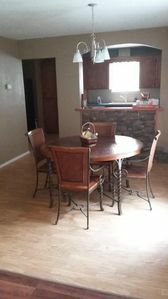 Convenient "In Town" location!